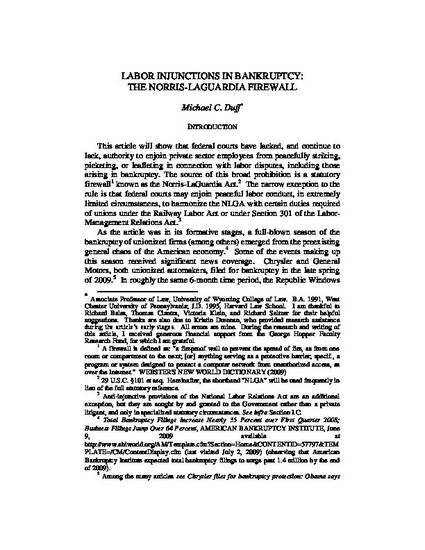 This article considers whether federal courts, including bankruptcy courts, are authorized to issue injunctions in connection with various kinds of labor disputes arising after the filing of a petition in bankruptcy. The question takes on renewed importance in light of the record number of Chapter 11 bankruptcy filings in 2008, including filings by two of the three major American automakers, which are unionized. Given the increasing complexity of some of these notorious reorganizations, it appears that post-petition labor disputes are likely to arise. In agreement with the few federal circuits that have considered the question, the article concludes that, as a matter of statutory interpretation, the Norris-LaGuardia Act (NLGA) bars the issuance of injunctions in these situations, even assuming the existence of conflict between the NLGA and the Bankruptcy Code of 1978. In addition to analysis of the provisions applicable to the respective statutory regimes, the article also explores the competing policies underlying the regimes, and concludes that the NLGA should prevail in instances of conflict because of its status as "superstatute."